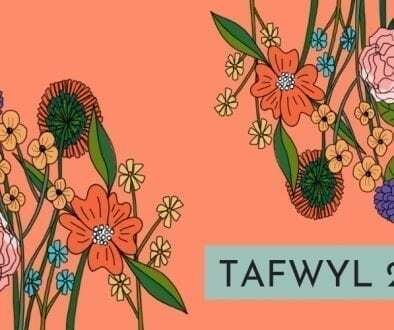 Band Pres Llareggub and Caryl Parry Jones lead Tafwyl 2019 weekend line-up! 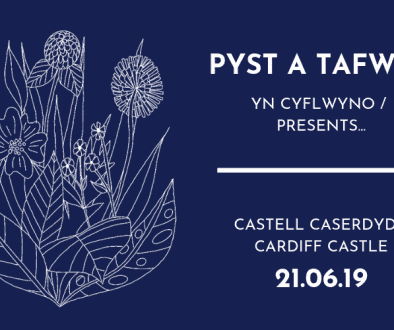 Following the exciting announcement that Tafwyl will open its doors for an extra night this year with Gwenno, Adwaith and Lleuwen amongst the names curated by PYST; the line-up of bands playing over the rest of the weekend at Cardiff’s annual Welsh arts & culture festival has been revealed. The event returns to Cardiff Castle on June 22 and 23, with 50 artists playing across four stages over the Saturday and Sunday. 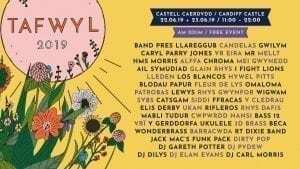 Band Pres Llareggub and Caryl Parry Jones will headline the Main Stage, supported by BBC Radio Cymru, with Candelas, Yr Eira, Gwilym, Mellt, Chroma and Mei Gwynedd also performing over the weekend. In the beautiful wooden barn ‘Y ‘Sgubor’, some of the artists taking to the stage include Mr, HMS Morris, Alffa, Glain Rhys, Siddi and I Fight Lions, as Tafwyl and Clwb Ifor Bach enter a new three year sponsorship deal supporting the development of Welsh music in the capital. Exciting young artists on the Yurt T stage include Sybs, Lewys and Y Cledrau; and brass, jazz and funk bands including Bass 12, 3D Bass and RT Dixieband will be amongst the names attracting attention to Llwyfan y Porth on Castle Street. Thanks to the support of For Cardiff, many artists and street performers will have the opportunity to perform all over the capital this year, bringing the Tafwyl celebrations to city centre audiences and outside the castle walls for the first time. As well as the feast of music there will be a variety of food and drink stalls including The Bearded Taco, Grazing Shed, Meat and Greek, Brother Thai and Ffwrnes as well as more bars than ever before. On top of the music, the festival will continue to showcase the very best of Welsh arts, culture and sport. A full programme of literary, artistic, children, sporting and comedy events will be announced soon. Entry to Tafwyl is free & open to all – Welsh speaker or not. It’s a great event for families, Welsh learners & people experiencing Welsh language & culture for the very first time. As with each year, a fringe festival will be held across the capital as part of Tafwyl, with various events taking place in museums, libraries, cafes and bars between 15 – 23 June.